The AICP certification of Debbie Love, a planner based in Fort Lauderdale, Florida, was suspended in December 2017, following a settlement agreement with the AICP Ethics Officer regarding a charge of ethical misconduct that had been filed against her by a former employer. The one-year suspension relates to violations of Rules of Conduct #4 and #6 in the AICP Code of Ethics and Professional Conduct. According to the settlement agreement, Ms. Love failed to make written disclosure to her fulltime employer, a private consulting firm, that she was involved with another consulting firm at the time (Rule #4). During this same period, Ms. Love also approved sub-consultant agreements from her then-employer to two other firms, including one where she had an ownership interest and one that was owned by a relative (Rule #6). Due to the severity of the violations, the Ethics Committee decided to publish this case, including the name of the planner, for the attention of membership. The AICP certification of Patricia D. Blackshear was revoked in August 2017, after it was learned that Ms. Blackshear had pled "no contest" to three counts of perjury, which were related to a prior job as a county planning director. Following her plea in September 2016, Ms. Blackshear was sentenced to five years probation by Walton County (Florida) Circuit Court Judge Ross M. Goodman. The AICP Ethics Committee decided to revoke Ms. Blackshear's certification after it determined her actions constituted a "serious crime," as defined by the AICP Code of Ethics and Professional Conduct. The Code's section E3 states that "the term 'serious crime' shall mean any crime that, in the judgment of the Ethics Committee or the Ethics Officer, involves false swearing, misrepresentation, fraud ..."
The Ethics Code also states that "the membership of a Certified Planner shall be revoked if the Planner has been convicted of a "serious crime" ... whether the conviction resulted from a plea of guilty or nolo contendere" [i.e., no contest]. Ms. Blackshear was inducted into the College of Fellows of the American Institute of Certified Planners in 2012. Her FAICP certification also was revoked by the Ethics Committee. Ms. Blackshear will be eligible to request to have her certifications reinstated in August 2022. This was the first instance of the revocation of an AICP certification in more than a decade. 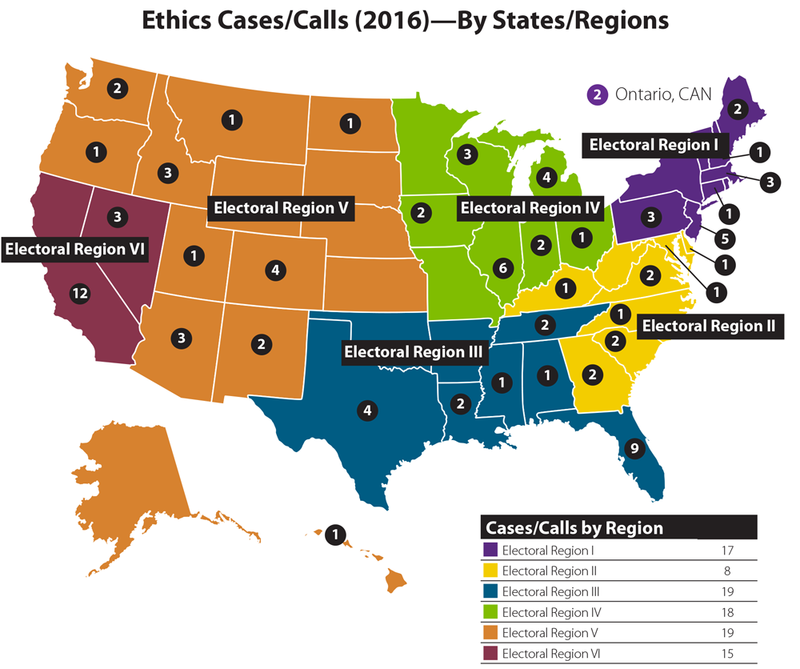 Misuse of the AICP Credential (five cases) — Ethics Officer directly contacted offending parties by letter and email. One case demanded a follow-up letter by APA's attorney, whose legal costs were reimbursed by the offending party. All parties ceased use and corrected their business cards, web sites, etc. 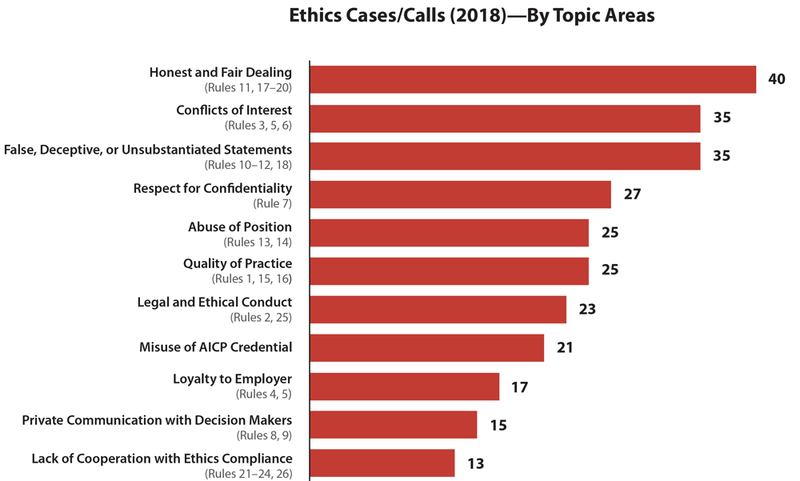 Recommended draft revisions to the AICP Code of Ethics and Professional Conduct (new Sections C, D, and E), which were approved by the AICP Commission (April). Prepared "Case of the Year" for ethics training purposes. Prepared draft proposal for "Embattled Planners" assistance to AICP Commission; currently updating proposal. Supported a Letter of Admonition as a settlement for one ethical misconduct case. Issued an Advisory Opinion based on a request by an APA Chapter regarding chapter board conflicts of interest. Drafted new ethics-related questions for AICP Exam. Upheld a case dismissal by the Ethics Officer, following an appeal by complainant. Organized an educational webinar, "Ethics and the Digital World," (December) as response to a recommendation by APA's Smart Cities and Sustainability Initiative. 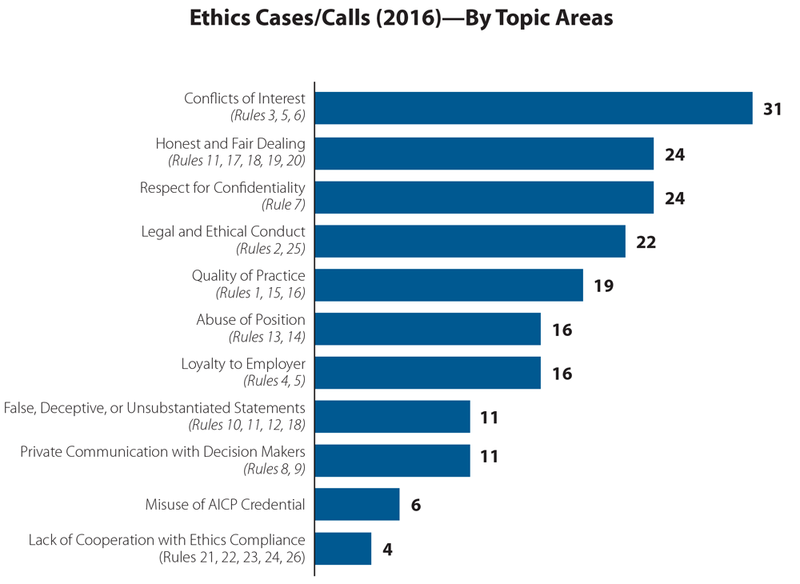 These requests for informal advice covered a wide variety of ethical topics, as shown in the chart below. 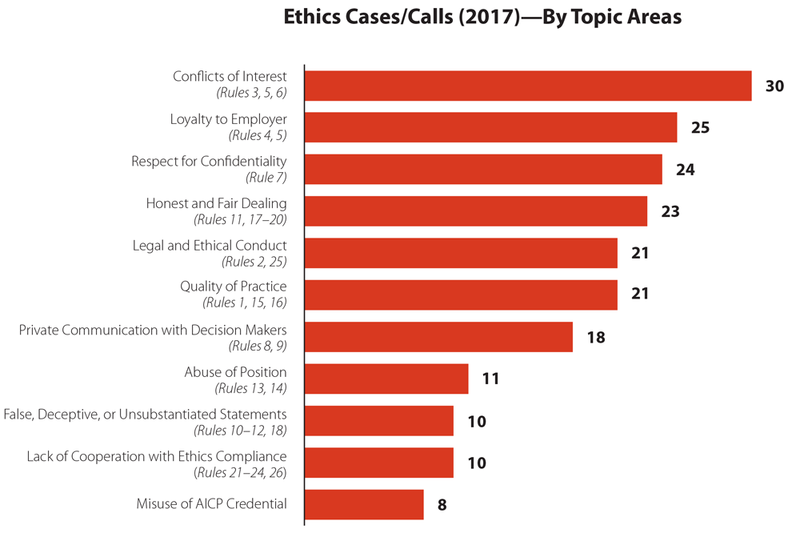 Note: These numbers reflect issues from misconduct cases and from requests for informal advice. Upon appeal, upheld Ethics Officer's dismissal of case. Case settled through training requirement. 1 Determined Member Violated the Code.